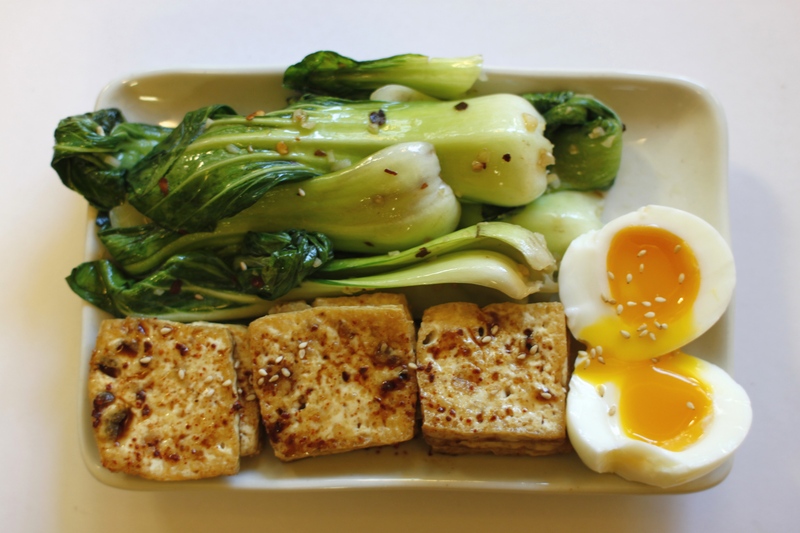 Garlic Chili Bok Choy, Fried Tofu, and a Soft Boiled Egg — Oh Wonderful! I ate nothing fresh last week. Like, 0, nada, nilch, nein, nothing. Therefore, I was STOKED when I saw some baby Bok Choy heads at the Farmer’s Market. I’ve been eating so much rice as of late, so I whipped up this plate of fresh veggies, organic soft boiled egg, and some good ol’ fried tofu for some healthy crunch. This would be perf for a bento box lunch, mixed in with more fresh greens or as a quick and easy dinner. I’m planning on doing all of the above. 1. Heat vegetable oil in a pan on medium-high heat and saute garlic to let the flavors release. Toss in bok choy until leaves are soft and slightly wilted, or around 4-5 minutes. 2. Before removing bok choy from heat, toss in sesame oil and chili flakes and saute for another minute. 3. Before serving,sprinkle with a dash of soy sauce. 1. Heat oil in a pan on medium-high heat while patting tofu dry. 2. Carefully drop tofu into oiled pan, fry 5 minutes on each side or until slightly golden. 3. Drizzle with soy sauce, sesame oil, and gochugaru. Boil a saucepan of water until water is bubbling and steaming. Drop in a few eggs (however many fit in your pan) and set the timer for 6 minutes and 10 seconds. Ladle out with a slotted spoon, gently place in an ice bath, and peel egg carefully away from the eggshell. Slice in half, and enjoy!